Volunteers help make the world go around! 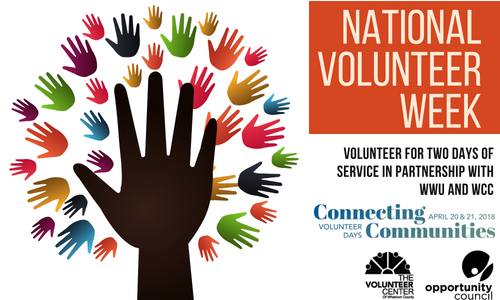 Every mid to late April we celebrate National Volunteer Week with service day and other activities to highlight volunteerism in our community! This week usually coincides with Earth Day, April 22nd, so activities are often themed around earth day. Chores around the house! The Volunteer Chore Program hosted small groups (5-6 people) to do small chores around the house of seniors and individuals with disabilities. Comfort Kids Project: The Bellingham Sock Monkey Project: volunteers build sock animals for children in need. Each sock animal is donated to Skookum Kids with a backpack to hold their pajamas. Cordata elementary trail maintenance: Whatcom Community College helps maintain a trail connecting their campus with Cordata Elementary. This day of service helps maintain the trail and get it ready for spring use! Volunteer Week Fair – Held at the Bellingham Central Library, this was an opportunity for the public to meet with non-profit organizations through out whatcom county. Community Engagement Forum – “Building Resilience through Skill-Sharing and Volunteering:” a panel discussion on the importance of skill-sharing and volunteering to creating a resilient community in Whatcom County. Watch for National Volunteer Week opportunities late March, early April. If you or your work team are interested in participating, please contact us at frontdesk@whatcomvolunteer.org or 360-734-3055.